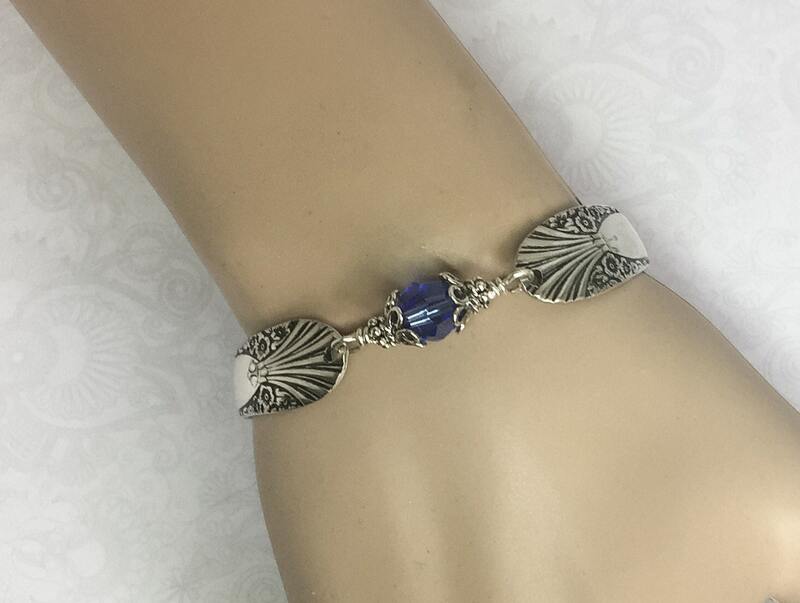 Actual Wrist Size 5.5" 5.75" 6" 6.25 6.5" 6.75 7" 7.25" 7.5" 7.75" 8" 8.5"
This slender, silver spoon bracelet was created from two sterling plated vintage teaspoons. The pattern is 'Radiance' from 1939. 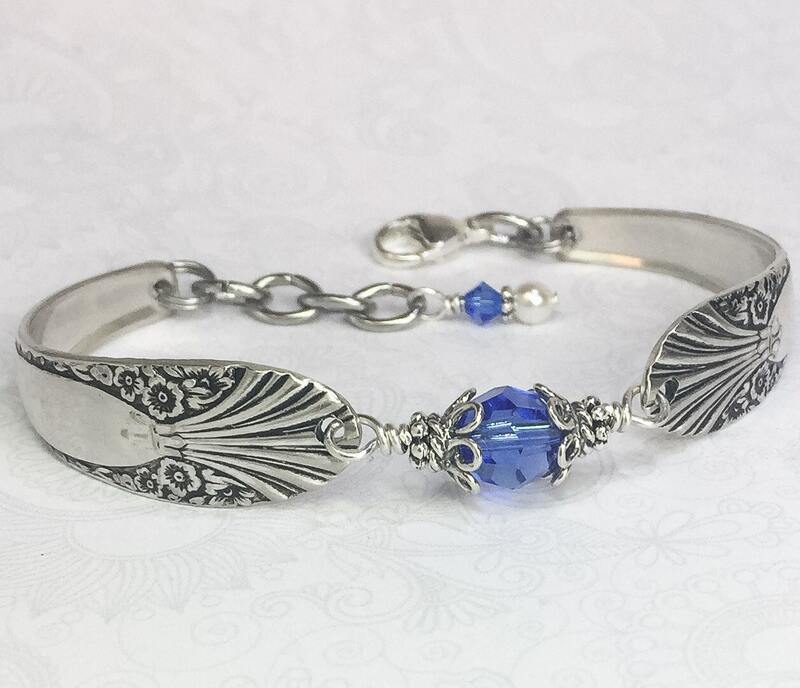 The bracelet is adorned with a sparkling 8mm sapphire blue swarovski crystal which is attached with twists of sterling silver wire and dressed up with two antiqued sterling bead caps. 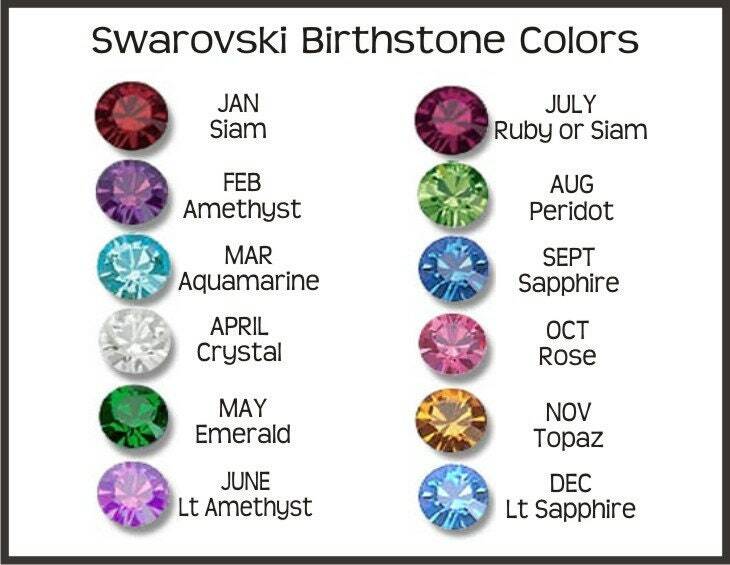 You may also opt for a different Swarovski crystal or pearl at checkout. If you like this bracelet just as it is, choose "NO CHANGE". 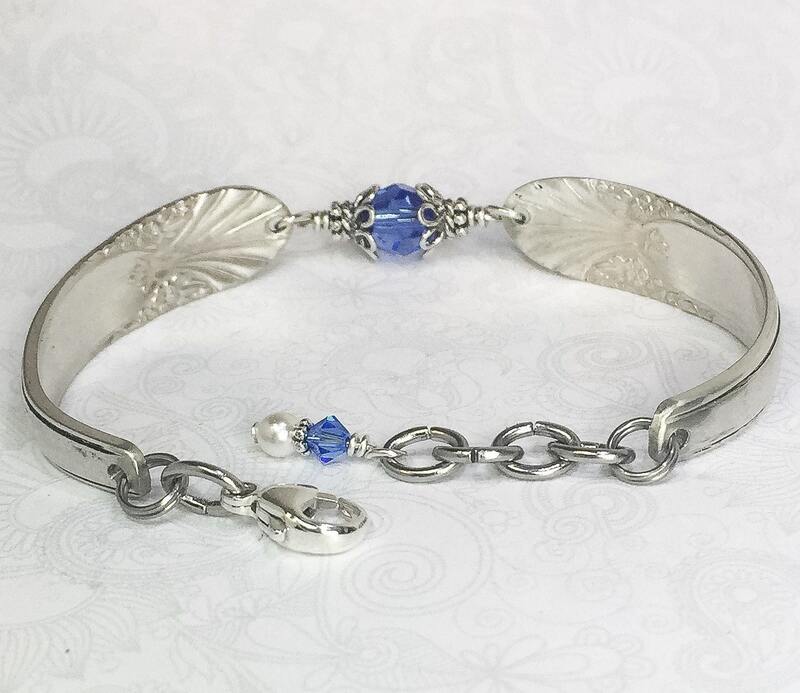 The spoon bracelet is finished with a sterling silver lobster clasp for security. There are also extra links for a flexible fit, and they're topped off with a smaller blue crystal and pearl at the end. Your bracelet will also include a complimentary bracelet hooking tool for easier on and off. SIZE: As is, this bracelet will fit a 6 1/2" to 7 1/4" wrist, so it will fit most average size wrists nicely. For a truly custom fit, you'll be prompted at checkout to provide your wrist measurement so I can fit your bracelet just for you. Measure right at the base of your hand, and please don't add anything. I need just the actual measurement. If it's a gift and you're not sure of the size, it will still be fine for most wrists within the average range. If you suspect your recipient is either on the smaller or larger end of the spectrum, just leave me clues in the 'note to seller' box at checkout. 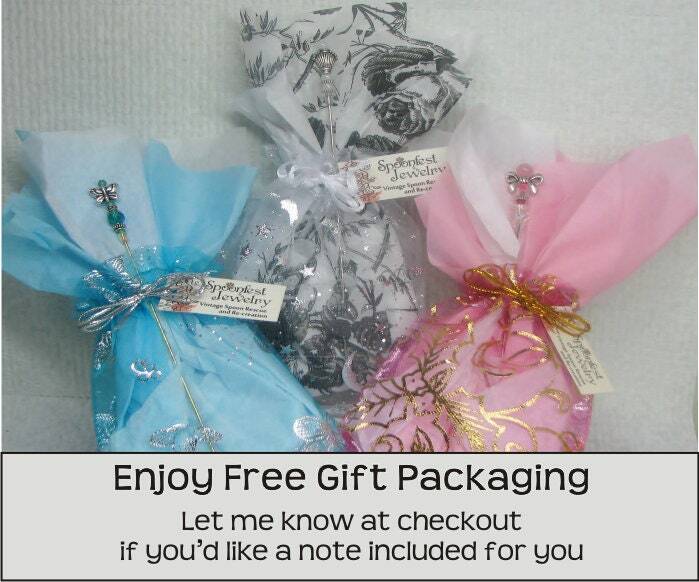 This elegant piece of silverware jewelry comes to you in a festive organza gift bag, along with a Spoonfest Jewelry story card, pattern name/age of the spoons, and your complimentary bracelet hooking tool.